The industrial market vertical is characterized by three prevailing application areas – discrete, continuous, and hybrid applications. Discrete applications are often referred to as factory automation or factory systems. The output of discrete operations are individual pieces or “discrete parts,” often manufactured in machines that stamp, form, cut, print, mold, and/or package the raw materials into usable or sellable parts. Continuous applications convert raw materials into usable or sellable product through, most often, chemical transformations without interruption. The product has no measureable beginning or end and is constantly being produced. Hybrid applications are combinations of discrete and process operations. Batch processing is a good example of a hybrid process. In batch processing, discrete amounts of materials are loaded into a vessel or similar piece of equipment, combined together as a mixture or with a catalyst to generate a chemical reaction, and then discharged from the vessel as a usable or sellable product. Hybrid applications are often combined with discrete applications to create products such as bottled or canned beverages, food products, pharmaceuticals, and similar packaged goods. A vehicle bus standard designed to allow microcontrollers and devices to communicate with each other in applications without a host computer. A computer network used for data transmission amongst devices such as computers, telephones, tablets and personal digital assistants. AS-i (Actuator Sensor Interface) is a bus made up of sensors and actuators with a very short response time. AS-i is an open industry standard supported by the AS-i association. CC-Link is open industrial network that enables devices from numerous manufacturers to communicate. ControlNet is an open industrial network protocol for industrial automation applications. DeviceNet is a digital, multi-drop network that connects and serves as a communication network between industrial controllers and I/O devices. It was developed for maximum flexibility between field equipment and interoperability among different manufacturers. EtherCAT is a real-time Industrial Ethernet technology (included in IEC standard IEC 61158) that is suitable for hard and soft real-time requirements in automation technology, in test and measurement and many other applications. Ethernet POWERLINK is a Real-Time Ethernet field bus system. It is based on the Fast Ethernet Standard IEEE 802.3. FOUNDATION fieldbus is an all-digital, two-way communications system that serves as a Local Area Network (LAN) for factory instrumentation and control devices. HART (Highway Addressable Remote Transducer) protocol is a widely accepted standard for digitally enhanced communication with instrumentation within the process industries. IO-Link is a point-to-point serial communication protocol used to communicate with sensors and/or actuators. ISA100.11a is a wireless personal area networking (WPAN) technology standard developed by the International Society of Automation (ISA). MODBUS TCP/IP is a variant of the MODBUS family of simple, vendor-neutral communication protocols intended for supervision and control of automation equipment. PROFIBUS is the fieldbus-based automation standard of PROFIBUS & PROFINET International (PI). PROFINET is an industry technical standard for data communication over Industrial Ethernet, designed for collecting data from, and controlling, equipment in industrial systems. SERCOS (Serial Real-time Communications System) is an internationally-approved communication standard for motion control (IEC 61491). 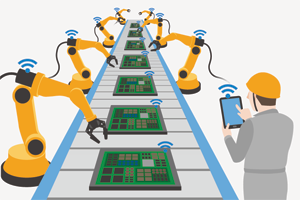 WIA-FA is a specification developed for the Wireless Network for Industrial Automation – Factory Automation. An IEEE 802.15.4-based specification for a suite of high-level communication protocols used to create personal area networks with small, low-power digital radios. A standard that specifies Fieldbus which is the name of a family of industrial computer network protocols used for real-time distributed control. A collection of IEEE standards defining the physical layer and data link layer’s media access control (MAC) of wired Ethernet. A set of media access control (MAC) and physical layer (PHY) specifications for implementing wireless local area network (WLAN) computer communication in the 900 MHz and 2.4, 3.6, 5, and 60 GHz frequency bands.